I liked how this story is told simply and the way music and dreams are at its core. I liked it the way I like John Carney’s Once and Sing Street (although I liked those two films more) because they all realize interesting characters in authentic circumstances and find ways to communicate profound feelings. I found Mr. Haley’s previous effort, The Hero, a bit less appealing, although that was also well grounded. 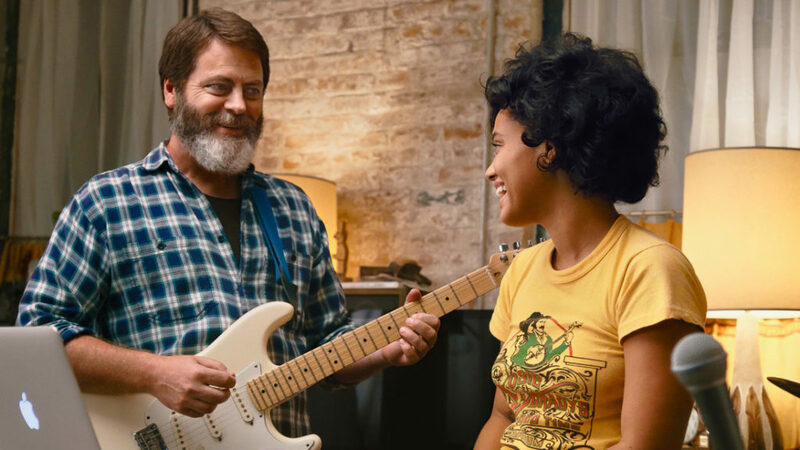 Nick Offerman as widowed dad Frank Fisher, does a great job of keeping a quirky/funny core in check as he struggles to let go – of his daughter Sam (Kiersey Clemons) on the eve of her moving away to college, his failing 17 year old record store business in Red Hook, Brooklyn, NY, and his dissipating dreams of a career in music. He’s also trying to navigate the changes in his aging mother (Blythe Danner) who is showing signs of dementia, and a potential romantic relationship with his landlady (an excellent Toni Collete).That’s a complex set of things in transition, especially when they involve his eminently empty nest and the changes in relationship with his daughter. Thank god he has a good friend in bar owner Dave (a far-out Ted Danson) to help him through. Sam is going through changes too, beyond what the usual transition to adulthood that college brings. She wants to become a doctor, seems very grounded in achieving and finds it hard to embrace her musical gifts as something more than distraction, and definitely not the career dream her father still holds. Her complicated feelings are no doubt influenced by her mother’s death in a bicycle accident (unseen), her inherited talent (mom and dad were in a band together, and her grandmother was a singer) and how their lack of wealth means she’s had to work hard to achieve her dreams and doesn’t think she can afford to ‘play’. Her budding romance with artist Rose (Sasha Lane) can only have a short life before she leaves for college, but Rose encourages her music and accepts the fleeting nature of their relationship. I appreciate that Sam’s character arc wasn’t the typically written teen we’ve seen a million times. Then there is the music, a really great mix of songs, from the father and daughter band and on the soundtrack in general. Ms. Clemons has a wonderful voice and performance energy (she’s an accomplished musician), and Mr. Offerman shows you the passion of someone who loves music and dreams of living a life steeped in that passion. We can hear that loud and clear. Should See. This entry was posted in Cinema and tagged Brett Haley, Cinema, Kiersey Clemons, Nick Offerman, Should See, Ted Danson, Toni Collette.